On most golf courses, the 19th hole is nothing more than the barâa watering hole, so to speak. 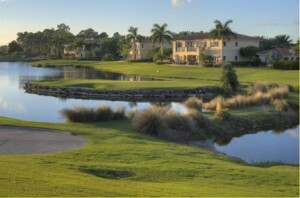 But at Old Palm Golf Club, youâll find a real 19th hole, just like the ones in Scotland. Traditionally, these holes were built to settle friendly wagers when golf matches were tied at the end of 18 holes, so they had to be challenging yet fair. The 19th or âbye holeâ on our course is a devilish, 99-yard Par 3 with an island green. It takes a heroic shot to get close to the pin, and hazards are everywhere. Depending on the wind and your tolerance for risk, you could hit anything from a sand wedge to a 7- or even a 6-iron. Be sure to give it a shot after your round. Itâs one of the few Scottish-style 19th holes in America and like the Old Palm golf course, it was designed by the legendary Raymond Floyd.